The Final Challengers isn't the deluxe reissue that it should've been, but it's still a solid enough version of Street Fighter II that lends itself well to portable play. Capcom’s decision to make their first major Nintendo Switch release an enhanced port of a 1991 fighting game has been thoroughly mocked online. I get why releasing a version of Street Fighter II would feel underwhelming to Nintendo fans, especially when the 3DS received an excellent portable version of Street Fighter IV, but even 25+ years later SFII is still a damn fine game at its core. 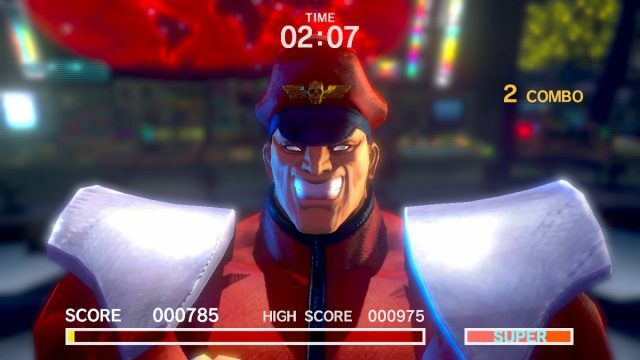 If any fighting title deserves a Criterion Collection style reissue, it’s this one, and Ultra Street Fighter II: The Final Challengers should be a love letter to the fighting game that brought the genre to prominence. For the most part, The Final Challengers gets it right. Capcom hasn’t messed with the core gameplay, which remains a tight fighting experience without a ton of systems to worry about. The biggest additions come in the form of some slick, updated graphics and two new characters, Evil Ryu and Violent Ken. Both play very similar to their regular counterparts, so there’s no balancing issues to be found here, although their speed and power have been adjusted. They end up being fun to play as, and give SFII veterans something new to master. While it’s natural for there to be a learning curve for new players, I didn’t expect to have as much trouble playing Ultra Street Fighter II as I initially did. As someone who typically plays fighting games with the D-pad when using a controller, I found myself unable to pull off something as simple as a hadouken with as much regularity as I’d expect. This was due to the Joy-Con’s horrendous directional pad, which is just four separate buttons due to it having to double as a complete controller. After missing more hadoukens in a 24-hour span than I had in the past decade of my life, I switched to using the analog stick, and it worked shockingly well. Due to how thin the stick’s base is, I found myself making precise movements with much more ease than I have on a DualShock 4 or Xbox One controller. I wouldn’t put it above using an arcade stick, but the Joy-Con’s stick is shockingly good for fighting games. It’s also worth noting that the game’s six button layout translates great to the Joy-Con grip, which makes it easy to get into local multiplayer matches. I may have been pleasantly surprised with how well the Joy-Con worked with the normal controls, but the same can’t be said for The Final Challenger‘s new Way of the Hado mode. Taking place from a first-person view, this mode has players using the controllers to perform special attacks. For example, I punched into the air to pull off a shoryuken, and forced my arms outward to shoot fireballs at enemies. It sounds dorky typing it out, but I can assure you that it’s an even more cringeworthy visual in real life. This mode only features three short stages (each of which consist of battling a bunch of goons), and the move recognition works okay, but not as well as one would desire. There’s also a progression system where players can become more powerful, and an endless battle mode, but the gameplay was way too lacklustre for me to actually consider going back to. The other new mode fares a bit better, but is also an underwhelming addition. Called Buddy Battle, it has players working as a tandem to take down computer opponents. Both players share a health bar since it’s a 2-on-1 affair, and can basically bully around the opponent at will due to the unbalanced nature of the mode. It’s a decent idea, and a cooperative mode would be a nice way to break up what’s otherwise a purely competitive title, but I didn’t find this to be particularly fun. It’s also limited to local play, so those looking to team up with a buddy online will be out of luck. What players can do online is compete in ranked and casual matches. My experience with the netcode has been very inconsistent though, as some matches played out perfectly, while others were a lag-filled mess. It’s been playable more often than not, but I simply can’t give it a glowing recommendation. 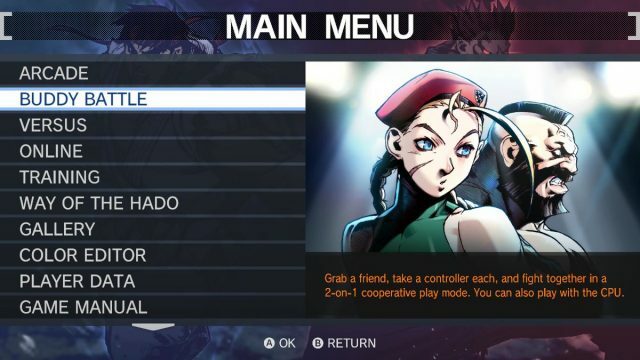 The casual match settings are bare bones, but it’s easy enough to set up a lobby for friends to compete in. Much like the rest of the package, it’s serviceable without going above and beyond as one would hope. Finally, the game features a complete scan of an artbook called Street Fighter Artworks: Supremacy. There are 273 gorgeous pages of artwork to look at, and including this out-of-print book with the game is a real treat. Sadly, like almost all of the game’s features, there are a few small things that keep it from being truly great. First off, there’s an annoying “help” icon in the upper left corner that pops up whenever the player zooms in or out or switches pages. It fades away after a few seconds, but it can’t be turned off completely. There’s also no good way to bookmark pages, which means players have to browse the book page-by-page. Finally, the book is completely in Japanese, and hasn’t been translated at all. This is too bad, as there are some humorous 4-koma style comics included that I’d love to understand, and there are plenty of notes that I can’t make any sense of. None of my issues with The Final Challengers are huge, but it’s a package filled with a bunch of little disappointments that build up. From the inability to switch graphic modes on the fly to not being able play the bonus stages found in the original arcade release, it isn’t as fully featured as it should be. It’s also missing a few modes that would help the game as a single-player package, such as survival and challenge offerings. Capcom could’ve done the classic game justice with a bit more tender loving care, but this simply isn’t on the same level as the recent work done by Digital Eclipse. Ultra Street Fighter II: The Final Challengers is a disappointing port of the most important fighting game ever made, but that doesn’t make it an unenjoyable outing. Both of the new characters are a blast to play as, and end up fitting right in due to being tweaked versions of existing fighters. The lackluster selection of modes ends up hurting the port from becoming the ultimate package, one which could appeal to a broad base, but I’m still quite happy to now have a solid portable version of SFII that lends itself to pick-up matches. This review is based on the Nintendo Switch exclusive, which was provided to us.